Carry a versatile pocketknife while supporting breast cancer research in the process with the Pink Dozier Thumb Notch Plain Edge Folding Knife from KA-BAR. With every knife purchased, 10% of the total proceeds will go directly to the Roswell Park Cancer Institute to fund breast cancer research and cure development. The purchase of just one Pink Dozier will help cut cancer from the lives of 200,000 Americans. 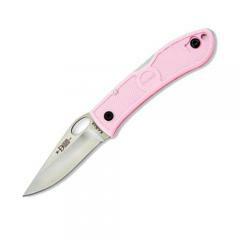 The knife is constructed from durable Pink Zytel to deliver a resilient grip that looks great. The blade is forged from ultra-tough AUS 8A steel to deliver the strength needed to hold an edge through daily use. The lockback mechanism secures the blade into a fixed position for reliable cutting without risk of accidental closure or injury.